ShodoShima Ryu Karate is a Japanese martial arts attributed to the ‘island’ of shodoshima, Japan. It deals with multiple attacks through evasive body movements and/or blocks as if drawing to opponent to expose himself. It follows the more classical curriculum wherein kata are not the integral part of its practice but mostly hands-on compliant self-defense and multifaceted gata or defensive routines and short prearranged combinations of strikes, blocks and kicks. 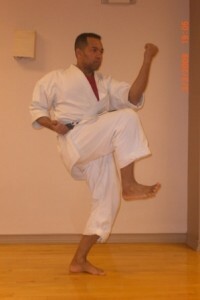 The basic curriculum or kyu (levels) contains only three forms or kata called Shodoshima Shokyu Kata, Shodoshima Chukyu Kata and Shodoshima Jokyu Kata. The advanced/black belt levels contain only one form/kata called Shodoshia Sho while the master level also share one kata passed down legitimately master to master. As a self defence system, Shodoshima Ryu karate does much to teach a sets of responses to a set of scenarios such as holds, chokes, thrusts, kicks and combination of these and multiple punches to vital organs. It also teaches a set of principles that can be applied in a more strategical settings. As a method of keeping fit and healthy, it develops dexterity, balance, co-ordination, aerobic fitness, strength and flexibility. In addition, (and unlike many other physical activities), it also challenges the brain and requires constant mental alertness and agility. Multifaceted conditions and counter attacks using kicks, punches and strikes. Joint locks, restraints and take-downs are also used. Finally, there are NO sporting elements to this tradition but it allows people of a sporting inclination to test their karate skills against others in a safe and controlled environment. The practice of ShodoShima Ryu karate is divided into five elements: 1) Kihon (basics), 2) Kata (forms), 3) Kobujutsu (weapons), 4) Taijutsu (defense) and 5) Kumite (bear hand sparring). However these five elements should not be considered separate, as they constantly overlap and rely on each other for superior development.